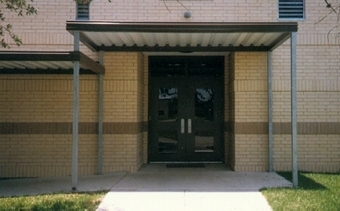 Project: Elementary School - LaGrange, TX. This is Childers middle grade for single slope walkway canopies. It features double row column design with a low roof slope of 1/4" on 12 and a internal drainage system. The WCD model utilizes a 14 GA. galvanized gutter beam which acts as both the support beam and the gutter. Water is drained from the gutter beam through the galvanized column and discharged at ground level. The gutter beam is then concealed by using our 26 GA. biscayne beam cover trim. Max depth / width for this model is 11'-0" for up to a 20 pound live load.